Britain’s Supreme Court will rule on Tuesday whether Parliament has a say in the triggering of the UK’s exit from the European Union, or if Theresa May can enact the legislation as prime minister. Eleven Supreme Court Justices will deliver the ruling at 9.30am on Tuesday, having already held a four-day hearing last December. The historic case will decide whether May can use executive powers known as ‘royal prerogative’ to invoke Article 50 of the EU’s Lisbon Treaty and begin two years of divorce talks. Britain’s High Court has already ruled in favor of a group of campaigners, led by businesswoman Gina Miller, who asserts the PM does not have the power to trigger Brexit without parliamentary consent. The campaigners, who are backed by the Scottish government, claim leaving the EU would strip Britons of rights they were granted by Parliament and so MPs must have a say. The case has attracted huge attention from the markets, with investors hoping Parliament will temper moves towards a ‘hard Brexit,’ which would see the country leaving the single market and customs union. It has also brought to the fore some of the ugly divisions among Britons produced by last June's referendum. Brexit supporters have cast the legal battle as an attempt by a pro-EU establishment to thwart the referendum result after Brits voted by 52-48 percent to leave the bloc. 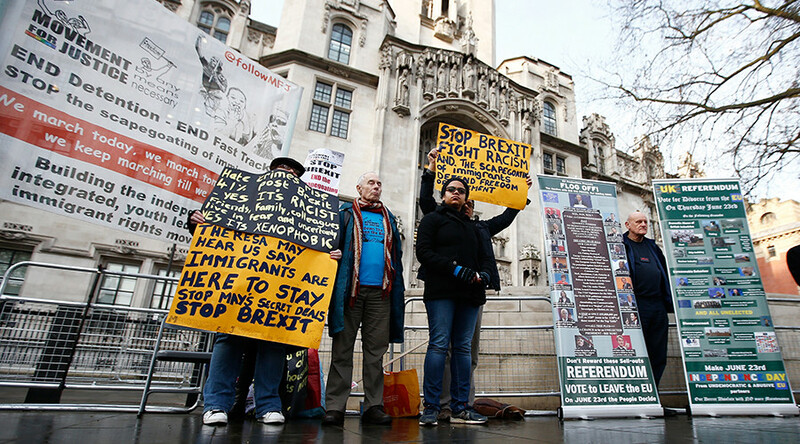 "We are not being asked to overturn the result of the EU referendum," David Neuberger, president of the Supreme Court, said at the conclusion of a four-day hearing in front of its 11 judges in December. "The ultimate question in this case concerns the process by which that result can lawfully be brought into effect." If the PM wins the case, she can follow her planned timetable for invoking Article 50 by the end of March. If she loses – which is seen as likely – her government will need to introduce a Brexit bill into Parliament which will be debated by MPs, the majority of whom back remaining in the EU. In a speech which sent jitters through the world’s financial markets last week, May said the UK will pursue a “bold and ambitious” free trade agreement outside the single market. “What I am proposing cannot mean membership of the EU single market," May said, adding she will seek the “greatest possible access” to the EU. The PM also said that she does not want to see a “cliff edge for business,” understanding how important it is to provide business, the public sector and everyone with "as much certainty as possible." May said there would be no more massive UK contributions to the EU budget, but possibly some modest payments. “Because we will no longer be members of the single market, we will not be required to contribute huge sums to the EU budget. There may be some specific European programs in which we might want to participate,” she said.